Earlier this year the Borough of West Chester moved its email services to the “cloud” with Microsoft Online Services. The Borough of West Chester was chosen as one of three Microsoft Cloud Services case studies. Afterward Microsoft published the following article which appeared in various Microsoft Publications and on their website. Ron Braatz, Liftoff, President, LLC. The Borough of West Chester, PA is a college town with a population of 18,461 (not including non-resident students) about 25 miles west of Philadelphia. It is home to West Chester University and boasts a vibrant small business community. The Borough has a total operating budget of $19 million – and only spends 1 percent of its budget on IT operations to support between 120 and 140 employees. The city keeps its IT staff costs low because one man manages all of the tasks for all departments – including the separate management of police communications systems. As the time approached to refresh the Borough’s technology infrastructure, William “Bill” Mann, chief communications officer and IT manager for the Borough was interested in applying cloud technology to improve operations while reducing costs. He turned to Microsoft and the technology implementation coaching services of LiftOff, LLC to migrate the Borough’s email system to the cloud environment. The results have been impressive. Bill Mann is not what you would call a job hopper. He started working for the Borough of West Chester right out of high school as departments just began experimenting with computers back in the mid-1980s. He embraced the IT revolution that was heating up then by volunteering to manage computers and communications technology for the police department. He parlayed the volunteer activity into a full time position, and eventually became the lone technologist in the Borough’s government operations. 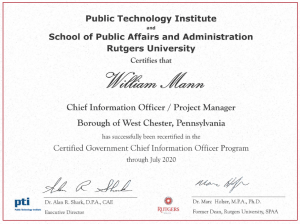 When Mann finally took over all IT activities for the Borough back in 1999, the first thing he did was merge the separate department-level IT resources. He consolidated all servers into a computer room where every department could connect for shared server access. “I had so many servers going – file servers, Citrix servers, security servers, along with an Exchange server,” he says. There were many department-specific IT applications that Mann needed to be able to support. For example, the police department needed people to be able to easily and securely access the system from satellite locations – they used the Citrix servers to accomplish this. Everyone used Microsoft Outlook, and the productivity application of choice among the Borough’s user community was – and remains – Microsoft Office. “Over a very short period of time, I decided to consolidate all of those infrastructures and migrate to a single domain,” Mann says. During the course of keeping up on trends in the IT industry, Mann started hearing a lot about the benefits of cloud computing. He took a keener interest as the time approached for him to upgrade the Borough’s computing and communications infrastructure. “This was the perfect time for Microsoft to get my business,” he says. West Chester was on a four-year replacement schedule rotation for its servers. In 2011, the Microsoft Exchange e-mail server came up for replacement. “People rely on mail for everything. If it’s down for a second, people know it,” Mann says. He wanted to find a solution that increased service and connectivity for all the users while making the email management and maintenance easier and less time consuming. After extensively researching cloud computing solutions and evaluating how they could fit into the Borough’s IT operations, Mann decided to pursue that course. He investigated multiple options – evaluating archiving solutions, backup plans and other critical factors – before determining that Microsoft’s cloud solution was the right way to go for the Borough. A key benefit he saw in moving to a Microsoft Cloud environment: employees already were familiar with the look, feel and performance of the Microsoft user experience, making the transition easier. Mann began his research back in November 2010. “If I wanted to move to cloud computing, I knew I had this $20,000 that I had already budgeted for the upgrade of the existing infrastructure sitting here,” he explains. “I knew I could buy a mail server or I could simply buy the best solution.” By February, Mann had made his decision: the Borough of West Chester was going to the cloud. In April, he had inked the deal with Microsoft. A month later, the Borough of West Chester moved its email services from the on-premises Exchange server to Microsoft’s Exchange Online cloud service. The Borough was able to deliver the functions employees had become used to having in the old environment – unified messaging, fax/scan/copy to email and help desk task orders. Microsoft also offered Mann a certified Microsoft Partner to help out with any migration challenges: Baltimore-based LiftOff LLC. Braatz, a veteran of scores of cloud migration projects in the public sector, worked with Mann on a migration checklist, reviewed the requirements assessment, and collaborated to put in place a structured migration process that would ensure success. “The assessment phase itself consists of addressing a set of 35 questions, half of which define the project and with the rest designed to uncover any traps or potential pitfalls that I’ve encountered previously,” Braatz explains. Based on the analysis of the assessment Mann and Braatz laid out a project plan, prioritizing the four or five key decisions that would determine the final results of the project. One of the most critical decisions was whether to do a so-called “Big Bang” migration – in which the entire transition is executed over a weekend – or opt instead for controlled migration over a longer period of time. “While getting it done all at once has its fans, I think that can lead to a lot of unnecessary troubles,” he says. • Cost Savings: Since West Chester no longer had to maintain the Exchange mail servers, it no longer has to pay out $20,000 from the coffers to replace those servers every four years. Now, there is a monthly cost of the subscription, which is less than Mann requested in his budget. In 2012, he can retire the city’s stand-by server, which would have cost $10,000, and replace it with the one formerly running Exchange. • Efficiency: Compared to what Mann felt he could deliver from on-premise solutions, he believes the cloud-based email services are far more efficient and include better security and data protection while offering more flexibility in how employees access their email. Essentially, it delivers more services to users for a much lower up front cost. • Corporate-Compliant Archiving: Because West Chester is a government entity, it is required to archive files – including email. The cloud solution makes it easier to archive data without creating additional infrastructure requirements. As a result Mann is in a better position to comply with requests from courts or other government entities. • Backup and Disaster Protection: Instead of all the email residing on a single server in West Chester, Borough data today is mirrored and stored in geo-redundant datacenters managed by Microsoft. The existing remote archive backs up only a single version of the file. “The security and availability that these centers can provide is better than anything I can do,” Mann says. You can read the article as published by Microsoft at http://www.microsoft.com/casestudies/-/West-Chester-Pennsylvania/West-Chester-PA-Takes-Email-To-The-Cloud-Cuts-Costs-While-Boosting-Efficiency/4000011009. This article is scheduled to appear in the Borough of West Chester’s Fall 2011 Newsletter. 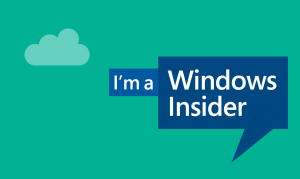 You can download Microsoft’s Published Article here. 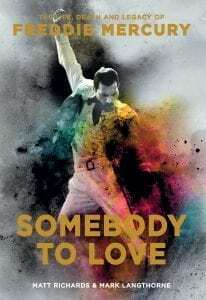 Somebody to Love is an authoritative biography of the great man. Here are previously unknown and startling facts about the singer and his life, moving detail on his lifelong search for love and personal fulfillment, and of course his tragic contraction of a then killer disease in the mid-1980s. We all have a “love – hate” relationship with technology, Even Star Trek’s Data gets frustrated when Windows misbehaves. How does Advanced Identity Protector install on your PC?